Throughout the site, you'll find references to knife techniques that may be unfamiliar to you. It is very important to learn Japanese cutting techniques in order to get the right taste and texture. For instance, just as in Italian food, where the different shapes of pasta taste differently and are adjusted to match various sauces, the shape of a vegetable is very important to the taste, visual enjoyment and texture of a recipe. The list below outlines some of the most popular cutting techniques. Having the right kind of knife makes all the difference. Refer to the Japanese knife section for information on the different types of knives and where you can buy them. Sengiri (Julienne): After peeling, cut the vegetable (for instance, a carrot or daikon) into 3-inch lengths. Cut a thin wafer lengthwise from one side and turn it over, so it safely lays on the cutting board. Proceed to cut wafers as thin as possible (I usually cut them in 1/16- to 1/8-inch slices), then stack the wafers and cut into thin or fine julienne. Matchsticks: Use the same technique as above, but cut into thicker pieces, such as ¼” by 1/4”, for soft and delicate vegetables such as yamaimo. For cucumbers in sushi, 3/8” by 3/8” is a good size, with the length as long as the sheet of nori. Slivers: To cut scallions or negi into slivers, it is necessary to cut at a very sharp angle (almost vertical), or, if the negi is very wide, cut it in half and cut the layers into slivers lengthwise. The resulting slivers will curl at both ends, especially when they are placed in ice water, and look lovely atop salads, soups and appetizers. Katsuramuki: The wispy strands of daikon that sit under the sashimi at your favorite sushi bar are not made by a machine, but cut entirely by hand by highly skilled chefs. This techique for cutting vegetables into gossamer-thin sheets is called katsuramuki, named after after a type of thin and transparent fabric favored by traveling aristocrats. Don't try this at home, but go to the Katsuramuki page for a step-by-step demonstration by Haruji Ukai of Kinmata ryokan and restaurant. Rangiri (Wedges): Cut the end of a vegetable (in this case, a carrot) at a 70° angle. Roll the gobo towards you and cut again, at a 70° angle. Continue rolling and cutting until you're finished. This makes an attractive shape that is good for simmering in soups. This is also a good shape for cutting carrots and cucumbers for salads. Rounds: For simmering large rounds of vegetables, such as daikon, it is more pleasing, and tastes better, when the edges are beveled. This can either be accomplished with a small paring knife, or with a vegetable peeler. Peel or cut around the diameter of both sides of the round at a 45° angle. After simmering, the daikon rounds have a pleasing rounded edge. Flowers and decorative shapes: You can make sakura flowers out of a carrot by cutting five even grooves lengthwise. Then, simply slice and parboil to place artfully in an arrangement. Or, slice any vegetable into wafers and use one of the lovely cutters made by Aritsugu. They have momiji leaves for autumn, sakura flowers for spring, as well as poetic shapes like hyotan and gingko leaves. 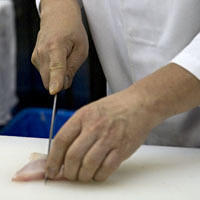 Cutting sashimi: There are a variety of specially made fish knives, including willow (sharp end) and flat sushi knives for cutting delicate slices of sashimi. The long knives are essential for cutting the fish in one long motion. If you don’t have a sashimi knife, try to start at the part of the knife closest to you, and then pull it towards you. If your knife is not long or very sharp, you will usually have to cut it in a few passes, which would result in a misshapen slice of sashimi. Cutting beef or chicken: For the most part, meat in Japanese cuisine is cut into bite-sized pieces that can be eaten with chopsticks. The next time you prepare steak, try cutting it into 1 1/2" squares. This way, you can flavor each morsel, and they will be ready with just a few seconds of cooking. When cutting thin slices of beef for shabu shabu or sukiyaki, it is helpful to partially freeze the meat.